We often share stories of the impact of UN Volunteers working with our partners to help those in need. Have you ever wondered who aids the aid workers? In Somalia, UN Volunteer Dr Jainarayan Singh (India) is responsible for managing medical care for 5,000 United Nations staff and their families. On the occasion of International Volunteer Day, Jainarayan Singh (seated, India), UN Volunteer Medical Doctor with UNDP, offers refugees a health check-up at Hargeisa Group hospital, Somalia. Jainarayan is assisted by Anand Shrestha (standing, Nepal), UN Volunteer Database Administrator with the UN Refugee Agency. 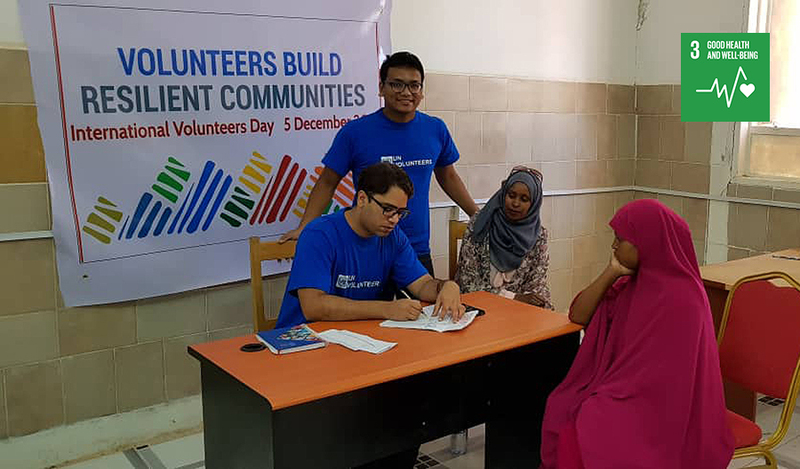 Jainarayan Singh is a 31-year old Medical Doctor from India, currently on a two-year UN Volunteer assignment with the United Nations Development Programme (UNDP) in Somalia. In his role as Health Manager ad interim and Medical Doctor, Dr. Singh is responsible for overseeing medical care and health support for the 1,050 UN staff (and 4,000 dependents) in-country, ensuring that humanitarian workers and other staff are fit and able to continue delivering essential services. The core of this work takes place at the five UN clinics throughout the country, where Dr Singh and eight other staff care for UN staff, their families and other humanitarian workers. At the clinic, Dr Singh and the team offer the full spectrum of medical services, including training in health risks, checkups and advice for mental health and general wellbeing. These activities equip UN staff with the necessary skills to support their own health, as well as allowing medical staff to screen for potential problems. Perhaps unsurprisingly given the intensity of the work, Dr Singh regularly sees UN staff with stress-related issues like high blood pressure. As these problems can often be addressed through lifestyle changes like diet, exercise and social habits, assisting staff with their overall health and wellbeing often proves highly successful. Of course, the role is not without significant challenges, and many medical issues arise that cannot be so easily addressed. Injured or sick staff might require specialist services or diagnoses, or even medical evacuation – something not easily achieved in a potentially unstable location like Somalia where resources are scarce. To perform his role, Dr. Singh draws on significant medical experience in India and other challenging environments. He previously served as Medical Officer for the UNDP in Kabul, worked in public and private Indian hospitals providing emergency medical services, surgery and routine care, and supported medical evacuations. Complementing this experience are his medical qualifications – including post graduate studies in public health, sexual health and health emergency management. Dr Singh describes the work as rewarding – and a unique opportunity for him to learn, and give back. This article was drafted with the kind support of Online Volunteer Will Seal.